9-24 February 2017, Uganda - Over three weeks, Parliamentarians, district local government officials and central government leaders in Uganda participated in trainings on mainstreaming gender in climate change adaptation activities in the agriculture sectors. The series of three workshops was organized and facilitated by the Food and Agriculture Organization of the United Nations together with the United Nations Development Programme (UNDP) under the “Integrating Agriculture in National Adaptation Plans” (NAP-Ag) Programme. Uganda has a number of laws and strategies in place to help ensure that gender is considered in national planning and budgeting processes. The country’s forthcoming NAP also includes developing more gender-responsive activities as one of its main eight priority adaptation action areas. The challenge that policymakers and implementers are facing is ensuring that these gender-responsive commitments are acted upon during policy development and implementation. The Uganda NAP-Ag Team undertook a detailed Gender Needs Assessment at the end of 2016. 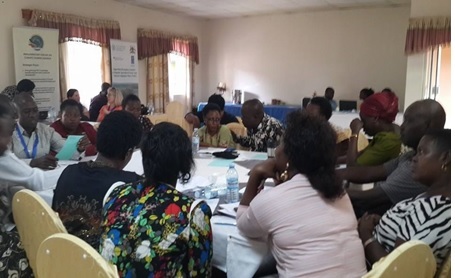 This informed the design of the three workshops, each of which was carefully tailored to the mandates and needs of key actors as well as ongoing efforts in Uganda to link gender equality to adaptation planning. The first workshop was held from 9 to 12 February in Mukono District for 30 Parliamentarians. Representatives from the Parliamentary Forum on Climate Change, Nutrition as well as the Uganda Women's Parliamentary Association were in attendance. Members of the parliamentary committees responsible for agriculture, natural resources and security were also present. Facilitators from organizations such as FAO, UNDP, Uganda Women's Parliamentary Association, CARE Uganda and the International Institute of Tropical Agriculture (IITA) highlighted the key gender gaps in the country’s agriculture and climate change policies as well as the process of gender responsive budgeting. This workshop was immediately followed by a three-day training for central government officials. It was held in the Mubende District. The workshop covered gender and climate change concepts, gender analysis and gender mainstreaming. It drew on presentations from the Equal Opportunity Commission of the Ministry for Finance and Economic Development and researchers from IITA, the Food Right Alliance and NARO. They spoke on topics like land tenure and women-friendly labour-saving technologies. Afterwards, participants went on field visits to areas where FAO has been promoting different climate change adaptation options through Farmer Field Schools under the Global Climate Change Alliance to see how climate resilient interventions focused on land tenure and Gender Action Learning Systems (GALS) are being implemented. The final workshop took place in the Luwero District from 20 to 24 February. There were 34 participants from local-level governments selected from 12 districts. Presentations covered key topics, including climate change impacts, gender equity certificates, GALS, the gender household approach and gender entry-points into the policy and budgeting processes from national to district level. The participants were also taken on field visits to see how these practices are being operationalized. “I will integrate gender and climate change issues into the workplan and budgets and will also lobby for logistical support for implementation,” explained one local government participant, when asked about plans after the training. The connections that participants made with farmers during these three weeks led to the development of a strong set of recommendations for further action. The NAP-Ag Programme is committed to supporting Uganda at all levels of government to implement gender-responsive activities to help its agriculture sectors better adapt to climate change.